Aside from Thunderstruck II, there is really only one other Microgaming slot that is universally played, universally renowned and continues to be one of the most popular online slot machine games on the internet, and it’s not even a progressive jackpot slot! That slot, is of course, Immortal Romance. This is vampire themed story, which is very tongue-in-cheek, and no doubt gets traces of its storyline from the many movies and TV shows featuring the creatures of the night, that have hit our screens in recent years. 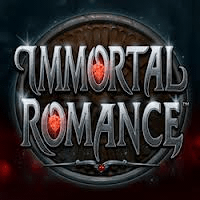 Immortal Romance is also one of the first slots to tell a story, the question is though; will there be a happy ending? This slot machine game is one of the Microgaming’s 243 ways to win slots, is played across 5 reels, and can be found in virtually every online casino offering top Microgaming titles. Players are invited to choose coin values of between £0.01 and £0.02 only; with a total of 10 coins per line, being permitted to be staked. This gives Immortal Romance and overall minimum wager of £0.30 per spin, and a maximum wager of £6.00 per spin. As in most Microgaming slots, the high playing card icons make an appearance as low payout symbols. They have been decorated in a sort of graveyard-tombstone fashion to make themselves agreeable with the theme of the slot. A scroll and pen, a creepy mansion, and the story’s four principle characters, Michael, Sarah, Ambert and Troy, make up the main and larger paying icons in this popular slot machine. Much like Thunderstruck II, this slot machine uses a series of bonus rounds with free spins as the outcome of its scatter symbol. The scatter icon is a Lion’s Head door knocker. This symbol, when struck 3, 4 or 5 times, anywhere on the reels, will trigger the Chamber of Spins bonus round. The more times a player triggers the bonus round, the better the bonus rounds get. The first time they ever activate the bonus round, players will enter Amber’s bonus round. This bonus round offers 10 free spins, at a 5x multiplier, and free spins can be retriggered during this round. When they enter the bonus round for the fifth time, they will activate the Troy bonus round, which offers 15 free spins and the vampire bats feature. This feature randomly turns symbols into 2x, 3x or 6x multipliers. The tenth time they enter the bonus round, players will be taken to Michael’s bonus round. Here, players will bag 20 free spins as well as triggering the rolling reels feature. With this feature, players can enjoy multipliers on consecutive wins, with multipliers worth up to 5x. Finally, entering the bonus round fifteenth time and onwards will trigger the Sarah bonus round. Here, players are awarded 25 free spins, with the wild vine feature. This wild vine feature turns symbols in additional wilds and free spins can be retriggered during this round. Players should keep an eye out for the Wild Vine special icon. This hugely popular, and you might even say, cult slot machine, uses its own logo as its wild icon. The wild icon in this slot machine has a double purpose and not only merely substitutes itself for all other symbols, with the exception of the scatter icon. It also offers double the payouts, when a playing uses it to complete a winning payline, with one or more wilds involved. This special feature is another way to bag serious money using wild icons. The Wild Desire icon is triggered randomly during gameplay. When it is, the Wild Desire feature will transform up to a total of 5 reels into wild reels, like nasty creatures of the night. This makes for a devilishly good surprise for players. Free spins cannot be triggered during the Wild Desire feature. With 243 ways to win, there is no excuse for not coming away with some kind of big win in this slot machine. The total jackpot on offer with Immortal Romance is a non-progressive 3,645,000 coins. Yes, that many. Players will note that this is worth around £1,200 in real money, when the maximum jackpot has been staked. This slot has a story, and the stories for all four of the principle characters can be viewed by clicking on the “story” button. This button can be found when a player clicks on the “view pays” button and moves across the screens to the characters. Players can learn interesting facts about each of the characters, and discover just which of the main characters has joined the legions of the living dead. Overall, the graphics in this slot are eerie enough to do the theme honour. Like so many gamers will say, and continue to say, it is a privilege to be able to play this slot machine; especially as it puts all other vampire-themed slots to shame.